The following group types are not accepted by this hostel: High / Secondary School, College / University If you have misrepresented the type of group you are booking for, your booking may be cancelled by the hostel." 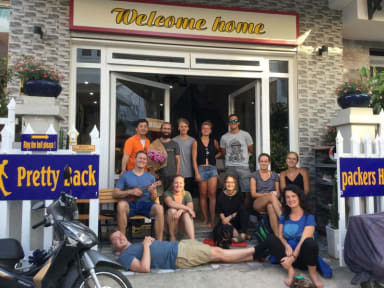 The Pretty Backpackers House is centrally located but in a very quiet and warm place; this is a kind of home stay for backpacker traveler in Dalat City. Pretty Backpackers house has 4 dorm rooms, maximum 8 pax per room. - Our bed wider than the other dorm (1,2 m * 2 m). In a ours room with only four bunks, and that holds eight people. - Blanket is thick and warm, wide 1m, 2m. - Comfortable mattress and thick 15 cm. - Lock safety cabinet, that can fit a laptop. - One floor has four toilets, fully equipped bathrooms with solar hot water systems in very strong pressure. - Near the city center - Terrace wide, airy, beautiful views. - Near the Excellent Gym. Amazing place. Arrived on a saturday which meant family dinner. That was really good and enjoyable. The family that runs the place really tries to do whatever they can for you and even more. I missed my pick up for the bus to HCMC. But they fixed everything so I got on the next bus only half hour later. The breakfast is good. The beds are bigger than a normal dorm bed. Really lived this place! Will definitely come back again. One of the best hostels I've stayed in. Huge beds, extremely kind and helpful staff, great location and breakfast. (Rooftop!) We were allowed to stay and relax in our beds and shower while waiting for our nightbus, even though we checked out long ago. Can not recommend this place enough! LOVE this hostel!!! We had such a lovely time staying here!! It is the first hostel in 2.5 months where we have felt at home - the owners make you feel incredibly welcome in their very clean and modern home! The dorms are big, with big comfortable beds in and plenty of room for your bags. The whole place is spotlessly clean, and there are plenty of modern and well kept bathrooms on each floor. The free breakfast is really nice, and the family dinner is a must on a Saturday! We had a lovely time. One of the vest hostel i visited!!! We arrived in Da Lat at 4am and took a taxi to the hostel which was closed on arrival. There was a notice to ring the bell but we didn’t want to wake anyone at that time so we waited until 6am which is still very early. Door was opened immediately and we were welcomed in. Had almost an extra day witout charge as checked in at 6am and were allowed to keep our room until the following evening. Great owners! Had a good but short stay here. I was welcomed with hot ginger tea and biscuits, which was needed as it is cooler in Dalat!! The facilities are adequate and the bathroom is clean and well maintained. I booked an easy rider tour with Mr Viet, a must do, he’s awesome!! Only downside was I got bitten by bed bugs which I know isn’t always to do with cleanliness. Also owners are very caring and protective and didn’t feel comfortable with me renting a scooter as I hadn’t driven one before. This was fair enough, a cautious approach! Beds and blankets are huge! The family running it is very nice and welcoming. And the wiener dog is so adorable. Party dinner was a great experience. Got to check in early and check out late which was great because of the bus schedules. A little quiet, but no complaints! Friendly staff with a kind welcome. Nice hostel nearby everything you would need. Rooftop is nice, but quiet whilst I was there.